Dundee director Giovanni di Stefano has told Georgi Kinkladze that he will not be given another chance to sign for the Scottish Premier League club. 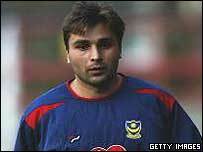 Georgia international midfielder Kinkladze stalled on a move to the Dark Blues before the transfer deadline. The club's interest in him has since cooled and the flamboyant Italian lawyer insists that there is no possibility of resurrecting the deal. "Kinkladze can forget it and the rest can forget it," said Di Stefano. "I don't play second fiddle to anyone, so there's no chance of him coming to the club. "I've said it before, but manager Jim Duffy makes the decisions and all I do is try and give him what he wants and, in this instance, he's not told me that he wants anyone. "We have signed Fabrizio Ravanelli and Craig Burley and are now concentrating on the players we have. "But, as always, if Mr Duffy comes to me with the name of a player and asks for X amount of money to spend on him then I'll do whatever I can." Di Stefano's words came as Rangers boss Alex McLeish disclosed that he had the chance to sign Ravanelli before Dundee. "Ravanelli is a huge name coming into the Scottish game," he said. "I'm sure a guy like that will want to do himself justice and set alight the Scottish game. "I think last year, if my memory serves me correctly, his name was thrown in when Derby were having some problems, but it just wasn't right for us at the time. "But he is a great player." Meanwhile, Dundee have added four associate directors to their board, although they are unlikely to be able to sit in on board meetings and vote on important issues involving the club. Di Stefano's son, Michele, business partner Paul Martin, close friend Reverend Richard Page and prospective son-in-law Frederik Meloni have all been added to the boardroom and, according to di Stefano, will take on an ambassadorial role for the club.